We all know the benefits of natural light, but what about its harmful effects? Did you know that ultraviolet (UV) rays can fade your furniture and flooring? And put your family at risk for skin cancer – even indoors? As a LLumar dealer for Eastern Tennessee and a Vista window film dealer for Western North Carolina, Custom Window Tinting and Design defends your family and belongings from the sun, providing unbeatable protection at an affordable price. Our home window film offers superior solar control, which means items in your home stay looking newer longer, and you can relax in comfort knowing you and your budget are defended year-round. Hot and cold spots throughout your home are not only uncomfortable, they can send your energy bills soaring. Residential window film prevents air conditioning from escaping during the summer and cold air from entering during the winter. No matter what the season, keep your family comfortable and see cost savings up to 40% when you install window tint. Custom Window Tinting & Design’s residential window film blocks 99% of harmful UV rays, dramatically reducing your family’s risk for skin damage and skin cancer. That’s why it’s recommended by The Skin Cancer Foundation! UV rays don’t only threaten you skin; they’re also threatening to your belongings! By blocking the sun’s rays, residential window film reduces fading to your furniture, draperies, carpets, and artwork, protecting your investments and keeping them looking brand new. LLumar, and Vista window tinting block 87% of glare from the sun. So whether you’re working on your computer or watching TV, your view won’t be compromised by the sun’s glare. Architectural window film enhances the privacy of your home by effectively reducing exposure of the inside to spying eyes. 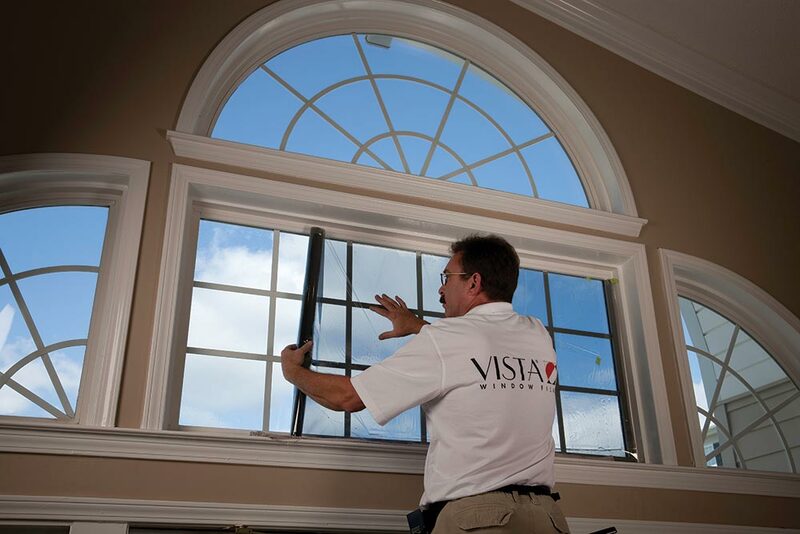 Additionally, the industry-leading durability of LLumar and Vista window tint make them difficult to penetrate, defending your home against possible break-ins. LLumar window films are available in a variety of decorative shades, patterns and designs that complement your personal style and add a unique flair to your home’s appearance. All LLumar and Vista residential window films are backed by a manufacturer’s warranty against discoloration, bubbling, cracking, and peeling, so you can be sure it always looks as good as the day it was installed. Plus, we offer our own 100% satisfaction guarantee on any residential installation! Don’t blow your budget on expensive window replacement to solve heat and glare issues when LLumar and Vista window film offer all the same benefits at one-fifth the cost! Whether you’re building a new home or updating the one you have, be sure home window tint makes your to-do list. For your free, in-home window film consultation, contact Custom Window Tinting & Design today.